^ Olympic National Park. National Park Service. ^ Port Angeles Federal Building. U.S. General Services Administration. 2011年4月30日閲覧. ^ a b Historical Weather for Port Angeles, Washington, United States of America. Weatherbase.com. ^ William R. Fairchild International Airport. 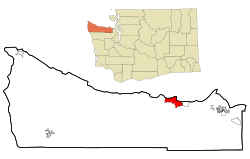 Port of Port Angeles. ^ Fares and Schedules 2011. Black Ball Ferry Line. 2011年4月7日.